Featuring architecture by the award-winning Robert M. Swedroe Architects, 353 Sunset Drive is a boutique collection of eight newly constructed, waterfront residences on the scenic Sunset Lake in Fort Lauderdale. The striking modern structure from visionary developer Weiner, Vollrath & Partners LLC was designed to resemble a world-class yacht, embracing the waterfront lifestyle and location amidst 165 miles of waterways in the coveted Las Olas neighborhood. Each residence is a uniquely expansive corner residence showcasing sweeping lake and sunset views. Three-bedroom floor plans feature airy, open-concept designs with floor-to-ceiling window walls and spacious, 12-foot deep private terraces. Masterfully designed interiors boast custom Snaidero chef’s kitchens with Miele appliances, imported Italian wood, marble and stonework, and luxurious master suites with spa-style baths. Private elevator foyers in each residence connect to climate-controlled, two-car garages. Turnkey designer model and designer-ready residences make for effortless living and are available for immediate occupancy. Residents enjoy the renowned Fort Lauderdale lifestyle with amenities including a private, heated, lakefront pool and cabana bath, lushly landscaped grounds, 150 feet of Sunset Lake frontage and deep-water individually powered yacht slips with direct access to the Intracoastal Waterway and Atlantic Ocean available for purchase. From its ultra-private location on Sunset Lake, the residences are moments from the city’s premier beaches, shopping, dining and entertainment. 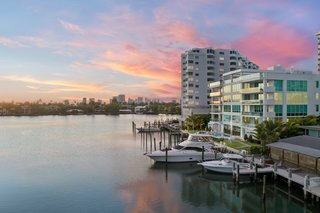 uploaded Striking, Modern Waterfront Residences Debut Along Fort Lauderdale’s Picturesque Sunset Lake through Add A Home.